Here’s something you don’t see everyday. I went to church yesterday not knowing that there’s a racing ministry that arranges on-site services here in the conference center on Sunday morning. 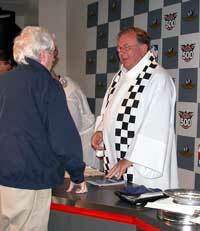 It’s the first time I’ve ever seen a priest with a b&w checkered stole!